This article is first in a series that will explore the realities and costs of mass and disparate incarceration for Wisconsin residents and communities and how Wisconsin might change course. This article is first in a series that will explore the realities and costs of mass and disparate incarceration for Wisconsin residents and communities and how Wisconsin might change course. As the first, it takes stock of how Wisconsin moved to this point over the past several decades and what our current circumstances are. After a modest decline in the prison population since its peak in 2007, at the end of 2017 Wisconsin was poised to incarcerate more people in its 37 prisons than at any time in its history.3 Despite having opened 15 prisons since 1990 – eight in the 1990s and another seven in the 2000s – plans have been advanced to build again. Wisconsin prisons are well above their design capacity,4 and the state is increasingly contracting with county jails to hold hundreds of overflow prisoners.5 Although the Wisconsin Department of Corrections’ (DOC) proportion of the general fund budget more than doubled from 1990 to 20166 and now exceeds $1.2 billion annually,7 the DOC faces staffing challenges, ballooning costs arising from an increasingly older and sicker population, and calls for programming that it cannot meet with the resources it currently receives. edu mmprosser wisc Mary Prosser, U.W. 1977, is a clinical professor at the U.W. Law School’s Frank J. Remington Center, where she has worked since 2003 in the Legal Assistance to Institutionalized Persons Project (LAIP) supervising students providing assistance to state inmates. She also teaches first-year criminal law courses. She is a member of the State Bar Criminal Law Section board and cochair of the Committee on Mass and Disparate Incarceration. Shannon Toole is a second-year law student at the U.W. Law School. She is a clinical student in the Legal Assistance to Institutionalized Persons Project. She is also a member of the Moot Court Board and the Wisconsin Law Review, as well as a research assistant for Prof. Cecelia Klingele. These current realities, combined with an increased understanding of the impact of mass incarceration on families and communities, as well as on prisoners, make it timely to ask if there are equitable, cost-effective, and safe alternatives to our current practices and policies. Wisconsin prisons are well above their design capacity, and the state is increasingly contracting with county jails to hold hundreds of overflow prisoners. Wisconsin’s embrace of longer maximum penalties and acceptance of higher prison populations means that today’s prison population is different from the population in 2000, with very different needs. Given the enormity of the growth in imprisonment, and the degree to which disparities exist, it is not surprising that some Wisconsin counties have already taken steps to reduce reliance on incarceration, racial disparities, or both. Prison admissions from Milwaukee County decreased more than 30 percent between 2007 and 201637 after the district attorney’s office collaborated with a research and policy group to examine whether prosecutorial practices might be contributing to racial disparities. It might be possible to create an avenue that would permit a person to seek termination of supervision after completing a significant portion of the supervision period or a designated amount of time without committing significant violations of the conditions of supervision. To accomplish these goals, states are experimenting with combinations of changes in local practices, legislation, and executive initiatives, designed to reduce both admissions at the front end and lengths of stay at the back end.46 Some localities and states have experimented with eliminating the use of cash bail and using risk-assessment tools to make pretrial detention decisions, cognizant of the research that indicates that pretrial detention is associated with higher conviction rates and longer sentences for the detained defendants47 – a potentially important source of race and class disparities in the criminal justice system. Additionally, many prosecutors’ offices are investing in diversion programs that may lead to fewer criminal records and jail or prison terms and avoid the collateral consequences of criminal conviction in cases in which they are not warranted. Persons released to community supervision could be given partial credit for “successful” time spent on community supervision. These initiatives are just a few of the many models being evaluated or adopted across the country to reduce prison populations and disparate confinement. Could any of these approaches work in Wisconsin? It might be worthwhile to test ideas about what is effective in protecting the public and in reducing the financial and human costs of incarceration and disparity in the criminal justice system. Given the structure of current Wisconsin sentencing laws, there are many opportunities for experimentation at a variety of points in the criminal justice system. A few are discussed below. For those on community supervision (parole or extended supervision), it might be possible to create an avenue that would permit a person to seek termination of supervision after completing a significant portion of the supervision period or a designated amount of time without committing significant violations of the conditions of supervision. (A similar option is currently available to persons on probation. )52 Research shows that a person’s risk of reoffending is greatest in the period immediately following release.53 A recent DOC study reported that one-half of those who re-offended54 within a three-year period did so within the first year following release from prison, and 75 percent re-offended within 21 months. Recidivism rates for persons who had served five or more years were the lowest, at 15.7 percent after three years.55 Recognizing success on supervision in this way would free up resources needed to supervise persons with greater needs or who pose a greater risk to public safety. Second, persons released to community supervision could be given partial credit for “successful” time spent on community supervision, that is, time during which the person complies with any restrictions imposed on him (for example, curfews, GPS monitoring, restrictions on employment and housing). Under this policy, those who complied with the rules of supervision could shorten their exposure to reconfinement by some proportion of the time they were successful on supervision. Those who are never revoked could shorten the length of supervision, while those who comply for a prolonged period before committing a violation could be reconfined for less time than the person who violated his supervision in the first month. This approach would both reward individuals who comply with supervision and recognize to some measure that the record on supervision was mixed and not a complete failure. Another possibility would be expanding opportunities for early release based on age or extraordinary health concerns. Such an approach would be both consistent with public safety and responsive to the enormously expanding financial burdens placed on the prison system by aging and sick prisoners. Release of elderly and seriously ill persons who no longer present a threat to public safety would also reflect the unique human and end-of-life realities faced by these prisoners and their families. The population of persons eligible for release on either of these grounds could be expanded to include those convicted of additional felonies and to parole-eligible inmates. Finally, to reduce racial disparities in particular, Wisconsin could commit to systematically collect and disseminate data to inform decision-making in the criminal justice system. A number of states already require their courts and corrections departments to maintain data on racial disparities and to provide that data, updated on a regular basis, to judges, prosecutors, and defense attorneys throughout the state. In addition, steps could be taken to encourage or require that prosecutors, judges, and corrections personnel consider the data on racial disparities in making charging, bail, plea-bargaining, diversion, sentencing, and correctional decisions. Wisconsin can continue on its current path of increasing incarceration and continuing racial disparities, even in the face of burgeoning budgets, strained resources, and the human costs these entail. Alternatively, Wisconsin could begin to take a leadership role in proposing and trying less costly measures that could improve our criminal justice and corrections systems and promote public safety. Future articles in this series will focus on more specific topics and offer suggestions for reform. In the year 1990, Wisconsin imprisoned approximately 6,000 people. Today, more than 23,000 people are incarcerated – in a prison system with a capacity far smaller. This astonishing explosion in our prison population has had enormous social and financial consequences for our state and its families, communities, and taxpayers. Yet the experience of Wisconsin compared to similar states with much lower rates of incarceration suggests that we are no safer for these immense costs. This raises urgent questions about whether we are administering our criminal justice system prudently and fairly – from the laws that control it to its practice at ground level. Let’s be clear: these problems are complex and the issues they raise can be contentious. But the stock in trade of lawyers is to study hard legal problems and find solutions. In truth, many Wisconsin lawyers have been working on these issues for years, whether as scholars, advocates, judges, or legislators. Last year, the State Bar began an initiative to bring some of these lawyers together to continue, and, we hope, amplify and accelerate that work. We held a symposium in Madison to begin that process, and from that start we formed a work group that is meeting regularly to develop and propose legislative, practical, and educational responses. 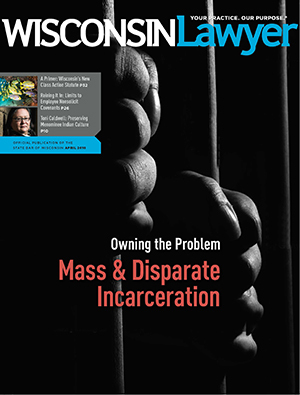 Starting in this issue of Wisconsin Lawyer, we will publish a series of articles addressing different facets of the incarceration crisis. We believe that incarceration in Wisconsin, while necessary, should be fairer for our citizens, safer for our communities, and less disruptive to our state’s budget. We believe all Wisconsinites would want that. We ask you, our members – the sworn protectors of equal justice under the law and practical, problem-solving professionals – for your attention and your assistance. 1 Joe Forward, Mass and Disparate Incarceration in Wisconsin: It’s Our Problem, InsideTrack (March 1, 2017). 2 See, e.g., Wis. Leg. Fiscal Bureau, Comparative Summary of Provisions: 2017 Act 59, at 205-29 (2017). 3 As of Dec. 29, 2017, there were 23,234 persons in prison, just short of the record high of 23,236 in 2007. Wis. DOC, Department of Corrections: Offenders Under Control on 12_29_2017 (Dec. 29, 2017), [https://perma.cc/RN9F-LA68]; Wis. DOC, Wisconsin Prison Point-in-Time Populations: 2000-2016 (2017) [https://perma.cc/48CA-QK2A]. The prison population increased by more than 600 in 2017. Id. 4 The prisons now house a population that is 30 percent above design capacity. See Wis. DOC, Department of Corrections: Offenders Under Control on 01_05_2018 (Jan. 5, 2018) [https://perma.cc/AFA4-9TKL]. 5 Use of contract beds more than doubled in 2017, from 216 to 450. Wis. DOC, Department of Corrections: Offenders Under Control on 01_06_2017 (Jan. 6, 2017) [https://perma.cc/P4HS-VRLX]; Department of Corrections: Offenders Under Control on 12_19_2017, supra note 2. 6 Inside Wisconsin Corrections: Inmate Numbers Down, But Starting to Rise Again, 85 Wis. Taxpayer 1, 4 (Apr. 2017). 7 Wis. Leg. Fiscal Bureau, supra note 2, at 205. 8 Wis. DOC, Wisconsin Prison Admissions, 2000-2016 (2016) [https://perma.cc/AJX6-QPE9]. 9 Wisconsin Prison Point-in-Time Populations, supra note 3. 10 Wisconsin Prison Admissions: 2000-2016, supra note 8. 11 Wisconsin, U.S. Census Bureau: Quick Facts (last visited Feb. 4, 2018) [https://perma.cc/WKE9-W2UT]. 12 Nationally, from 2000 to 2015, the incarceration rate fell more than 24 percent for African-American men and almost 50 percent for African-American women. White women’s incarceration rate increased by 53 percent. Eli Hager, A Mass Incarceration Mystery, Wash. Post (Dec.15, 2017) [https://perma.cc/H3S7-KXLT]. 13 In Wisconsin, the percentage of African-American women in prison fell from 46.9 percent to 20.91 percent, while the proportion of white and Native American women increased from 50 percent to 71 percent and from 3.6 percent to 7.0 percent, respectively. Wisconsin Prison Point in Time Populations, supra note 3. 14 Ashley Nellis, The Color of Justice: Racial and Ethnic Disparity in State Prisons, The Sentencing Project (June 14, 2016) [https://perma.cc/5LLB-T9RE]. 16 State-by-State Data, The Sentencing Project (last visited Feb. 4, 2018) (reporting data for 2014). 17 Nellis, supra note 14 (citing U.S. Dep’t of Justice, Office of Justice Programs, Bureau of Justice Statistics, National Prisoner Statistics (1978-2014)). 18 Wisconsin had the highest rate of jail incarceration of Native Americans in the country in 2013. Danielle Kaeding, Survey: Wisconsin Led US in American Indian Incarceration Rate In 2013, Wis. Pub. Radio (Jan. 26, 2018). 19 Racial Disparities in Youth Commitments and Arrests, The Sentencing Project (Apr. 2016). Disparity in the Wisconsin rates of confinement of African-American youth compared to white youth is even starker than for adults, at 15.5 times the commitment rates for white youth. Id. African-American and Native American youth comprised 64.9 percent and 4.2 percent of Wisconsin’s incarcerated juvenile population as of September, 2017.Wis. DOC, Division of Juvenile Corrections, Corrections at a Glance, September 2017. 20 Among them was Judge Thomas H. Barland, chair of the Criminal Penalties Study Committee. Wis. Crim. Penalties Study Committee Final Rep. (Aug. 31, 1999). In the forward to the committee’s 1999 Final Report on the implementation of TIS, Judge Barland noted the “ever-increasing corrections population” and “the problem of racial disparity.” Id. 21 Criminal Justice Facts, The Sentencing Project (last visited Feb. 4, 2018). 22 Incarceration Trends: Prison Incarceration Rate, The Vera Inst. (last visited Feb. 4, 2018). The prison population grew from 7,000 in 1990 to more than 20,000 by the end of 1999. Id. 23 Id. ; State-by-State Data, supra note 16. 24 Wis. Stat. § 973.014(1)(c) (2015-16) (applies to life sentences for offenses committed on or after Aug. 31, 1995, but before Dec. 31, 1999). 25 Presumptive mandatory release (PMR) permits the Parole Commission to deny release of a person convicted of a “serious felony” up to his maximum discharge date based on either 1) protection of the public or 2) the refusal of the prisoner to participate in certain treatment programs. Wis. Stat. § 302.11(1g)3. (2015-16). 26 The truth-in-sentencing legislation eliminated parole and required judges to impose a bifurcated sentence consisting of a period of confinement and a period of extended supervision. Wis. Stat. § 973.01 (2015-16). 28 Wis. Stat. §§ 301.11(7)(am), 302.113 (9)(am). 29 Wisconsin Prison Point-in-Time Populations, supra note 3; Wis. DOC, DAI – Admissions to Prisons Dashboard (last visited Feb. 4, 2018). 30 The number of persons sentenced to serve life sentences rose 68 percent, to more than 1,100 persons, and the average age of a person serving a life sentence increased 12 years, to 47 years old, between 2000 and 2016. Wisconsin Prison Point-in-Time Populations, supra note 3. Of the persons with life sentences, 223 have no possibility of release, compared to 37 in 2000. Information provided by the DOC, on file with the author. 32 Wis. DOC, Parole Eligible Inmates on December 31, 2014 (2014). 34 Criminal Penalties Study Committee Final Report app. D (Aug. 31, 1999). In 1997-98, 75 percent of men and 81 percent of women were granted discretionary parole. Wis. Leg. Fiscal Bureau, Adults Corrections Program: Informational Paper 54 (Jan. 2017). 35 Wis. DOC, Prison Releases: 2000-2016 (2017). 36 Wis. Stat. section 301.113(9g) applies to persons serving truth-in-sentencing sentences. 37 Prison admissions from Milwaukee County were 3,199 men and 330 women in 2000, 3,430 men and 263 women in 2007, and 2,317 men and 135 women in 2016. DAI – Admissions to Prisons Dashboard, supra note 29. 38 Jeffrey Toobin, The Milwaukee Experiment, The New Yorker (May 11, 2015). 40 Admissions from Milwaukee County comprised 58.1 percent of new youth commitments in the last quarter of 2017. Wis. DOC, Division of Juv. Corrections, Corrections at a Glance (2017). 41 Incarceration Trends: Prison Incarceration Rate, supra note 22; State-by-State Data, supra note 26. 42 Forward, supra note 1. 44 Marc Mauer & Nazgol Ghandnoosh, Fewer Prisoners, Less Crime: A Tale of Three States, The Sentencing Project (July 23, 2014). According to the same survey, Wisconsin had reduced its prison population by 4 percent from its peak, placing it slightly below the national average of de-incarceration. Some have suggested that the reduction in prison admissions from Milwaukee County after 2007 accounted for the 4 percent decrease in the prison population. Toobin, supra note 38. 45 Fewer Prisoners, Less Crime: A Tale of 3 States, supra note 44. 47 Criminal Justice Policy Program, Harvard Law School, Moving Beyond Money: A Primer on Bail Reform 6, 7 (2016). 48 A survey of states awarding “good time” or “earned time” listed Wisconsin as being in the small minority of states that had neither. Nat’l Council of St. Legislatures, Good Time and Earned Time Policies for State Inmates (Jan. 2015). Wisconsin’s previous system of good time and earned good time was repealed by 1983 Wis. Act 528. 49 Michigan enacted legislation in 2017 to limit incarceration for crimeless probation revocations to no more than 30 days. AP News Guide: Snyder Signs Criminal Justice Changes, U.S. News (Mar. 20, 2017). 50 Edith Brady-Lunny & Ted Gest, Justice Success Story: How Illinois Cut Its Prison Population, Crime Rep. (Jan. 29, 2018). 52 Wis. Stat. §973.09(3)(d) (2015–16). 53 Of those who are rearrested within five years after release from prison, more than three-quarters are rearrested in the first two years. Matthew R. Durose, Alexia D. Cooper & Howard N. Snyder, U.S. Dep’t of Justice, Recidivism of Prisoners Released in 30 States in 2005: Patterns from 2005 to 2010. 54 A 2016 three-year follow up recidivism report by the DOC showed recidivism rates of 14.5 percent, 25.1 percent and 31.3 percent in the first, second, and third years after release, in 2011, 2012, and 2013. Wis. DOC, Recidivism After Release From Prison (2016). In this report the DOC defines recidivism as committing a new offense within a specified follow-up period that results in a new sentence to either prison or probation (following a release from prison). Id.